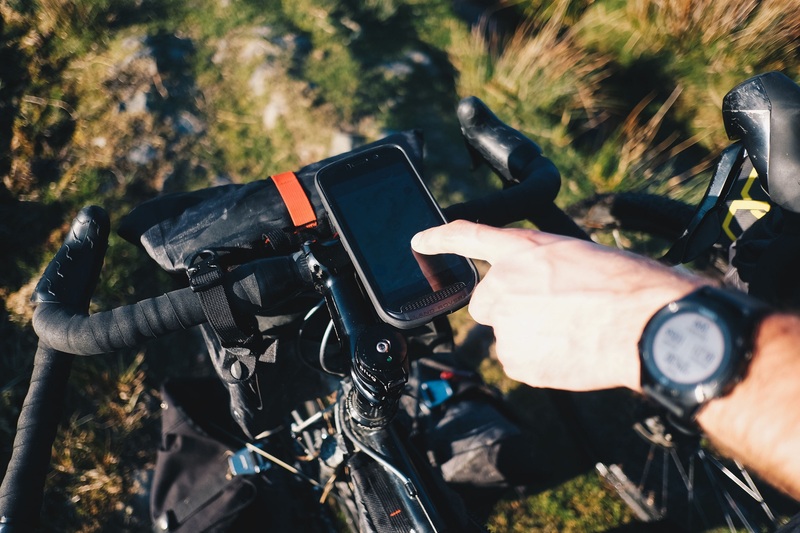 Here’s how to set up your Explore phone for mountain biking adventures. Use it to plan your route, check the weather and navigate hands free. There are many great biking Apps out there but they’ve traditionally been let down by a smartphone’s ability to run them. Ride for longer than a couple of hours and the battery’s almost certainly going to die – most likely just when you need to make a call. But the Explore phone changes all that. Not only can it handle the beating on your handlebars – and any dust, dirt or rain – but its 4,000mAh battery will see you through the day. So, here’s how to turn your Explore into the perfect bike computer for your two-wheeled adventures. To mount the Explore on the handlebars, order the custom bike mount. It costs £29.99. There are two mounting options, the stem cap mount which lets you adjust the angle and orientation of the phone and places the phone in the centre of your cockpit. Or use the handlebar mount, which fits any 25-32mm diameter bars. There’s nothing worse than trying to enter your security pattern or code while riding. So turn off your screen lock beforehand (settings > security). Consider adjusting your Sleep Mode to two or five minutes to prevent your screen dimming prematurely (settings > display). While you’re there, ensure Adaptive Brightness is switched on so you get the best display whatever the light conditions. And if you’re wearing gloves, turn on Glove Mode. The gem within Explore is the pre-installed ViewRanger App, which offers thousands of routes and maps all around the world. Looking for inspiration? Try one of the many routes created by Mountain Biking UK or create your own. Watch the tutorial here. Make sure you save your map for offline use to ensure you’re not relying on data to access your map while on the go. If you prefer not to be disturbed while on your ride, switch the Explore to Airplane Mode. Provided you saved your route for offline use (see above) you’ll still enjoy all the navigation benefits as the phone uses GPS signal – with the added advantage that you’ll conserve battery. Navigating on a bike is always more challenging than on foot. Make life easier by turning on the route alarm in ViewRanger (settings > navigation > off route (XTE) alarm). It will sound whenever you deviate more than 50m from your route. Another essential checkbox to tick in display settings is auto rotate map. Select this to ensure your map is always facing the direction of travel – vital for when riding. Let’s be honest, there’s only one stat you want when you’re gunning it down a trail – speed. In ViewRanger you can switch to a car’s needle & dial style view, or choose from 30 different stats by hitting the blue button on your map and then swiping left or right to select whatever you fancy. Want some hiking inspiration? Check out some of the best trails to follow on ViewRanger.